SIG MPX K PSB Ships Free! SIG MPX K PSB Pistol always in stock at the Best Price! SIG MPX Pistol is a revolutionary design with unmatched SIG performance. The MPX has redefined the sub-machine gun category with a new level of safety for the operator. SIG SAUER’s MPX in-combat adaptability and proven reliability in the harshest environments. SIG has out done themselves with this sleek compact weapon. 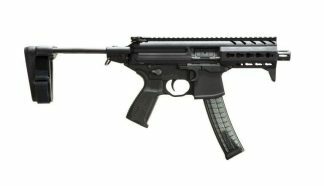 SIG MPX K PSB Pistol is a Short-Stroke Piston System. The Gas Piston system Reduces recoil and virtually eliminates carbon fouling. it is a open bolt design, once the last round is fired the bolt is held open on the last round fired.